I finally found a granola bar recipe I like! These are great to send with Leo to work for the day and I LOVE granola bars, too. This recipe is healthier and more budget-friendly than buying the store-bought bars. After I cut the bars, I store them in sandwich bags, 2 bars per bag, and pack with lunches... or just eat myself :) I'm going to store a couple in my Camelbak on Saturday's long run! Preheat oven to 350°F and spread oats on an ungreased baking sheet. Bake oats for 15 minutes, stir, and allow to cool to room temperature. Combine remaining ingredients in large bowl and add cooled oats. Spread the mixture into greased 9x13" baking sheet and press down to compact. Bake 25-30 minutes or until golden brown. Cool and cut into bars. 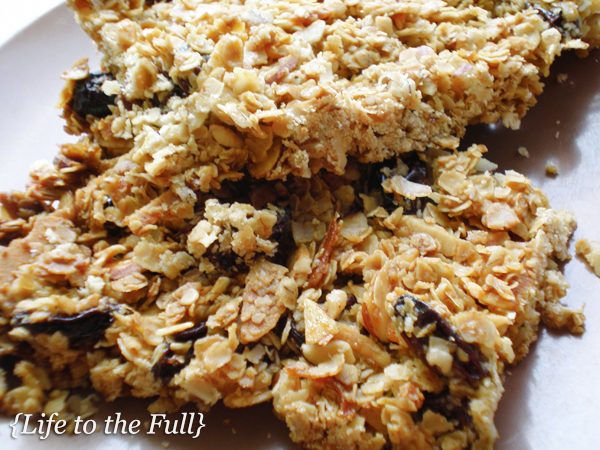 There are probably a million granola bar recipes out there - this one has been my favorite so far! What is your favorite granola recipe? Those look/sound good! I really liked this granola I tried: http://ahumblebumble.blogspot.com/2012/10/a-healthy-delicious-and-easy-to-make.html. I have yet to conquer granola bars though. Awesome - thanks, Erika! 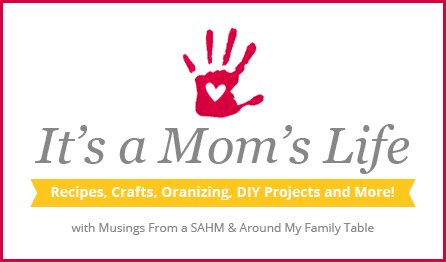 I will definitely continue to link up with It's a Mom's Life! Thanks, Katie! They turned out really great!